Your knees are shaking, your throat is dry, and out in front of you in the Lerenbaum Room of the Ramada Inn is the 167th Annual Meeting of the Tucson Dentists Weekend Warrior Organization. You step to the podium, there’s a short crackle of microphone feedback, and all eyes are on you. What do you say? Are you prepared enough? Will your audience love you? Hate you? If these are your fears, put them away and open up Professionally Speaking: Public Speaking for Health Professionals. In it, you’ll learn how to turn weak knees and wishy-washy introductions into confident gestures and words of wisdom. Packed with examples and proven tips and techniques from the front lines of public convention speaking, this helpful volume has everything you need to transform your next presentation from so-so to successful. Anyone who has faced or will face the potential disaster of addressing a large audience of colleagues--mental health professionals, dentists, physicians, pharmacists, for example--will want to consult Professionally Speaking before his or her next scheduled speech. 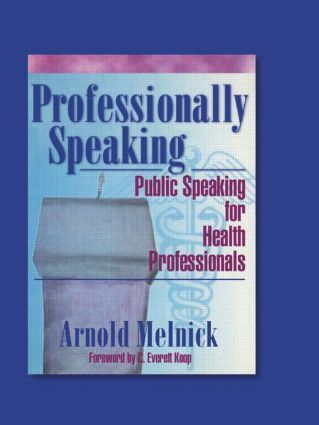 Useful as an introductory guide for beginners or a supplementary text for seasoned veterans, this practical, one-of-a-kind look at public speaking will change the way you see your audience and improve the way they listen to you.